The beginners class teaches the 108 move, health oriented tai chi set at a basic level. The main focus is to learn the choreography of the set: the “how to’s” of the moves (where to place your feet, how your body and hands move, how your weight shifts) and their sequence well-enough to follow a group of people doing the set. 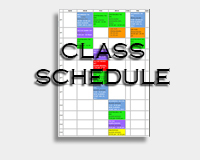 This class runs for approximately 3 months, after which participants can join any or all of the continuing classes. It's for all ages and capacities. This class is for everyone who has learned the basics of the 108 move health-oriented set. In our tai chi, there are no “levels” except for beginners and continuing or on-going – we all work together to deepen our knowledge and understanding of tai chi. Over time we learn how to “sit”, stretch, and relax and our moves become more internal. As each of us has a unique body, we learn how to adapt the various moves to our own particular needs. In this class, we teach the moves as we do with the tai chi set, concentrating first on part I, which has similarities with the tai chi set. When this is completed, we begin to work on the second part. This is another internal art, like tai chi, lokhup and sword sets. The sabre functions as an extension of the arm, providing added length and weight and thereby facilitating the use of the spine by the practitioner and increasing internal movement. 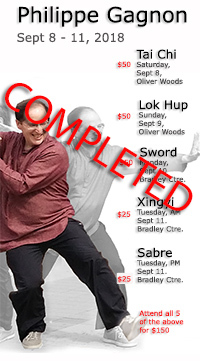 The sabre set practice ultimately improves the practitioner's tai chi form. We use wooden sabres as this set is not intended for fighting. 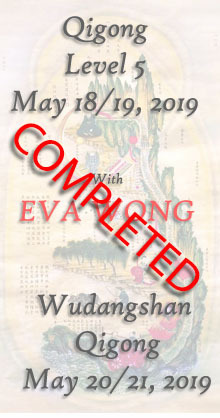 This Qigong practice is for all who attended Daoist Qigong workshops Levels 1 to 4, with Eva Wong, or one of her accredited instructors.